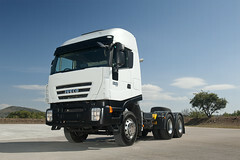 All Stralis models are available with various types of axle depending on the required application. o Final drive ratios (rear axles only). The rear axles are normally single-reduction type, with optional locking differential, and maximum permitted loads of up to 13,000 kg. A double-reduction (central and hub) rear axle is available as an option. The numerous final drive ratios (from 2.64 to 5.29) ensure optimum driving dynamics for all work requirements, and economical use of the engine on all types of routes. To complete the range, IVECO offers a series of fixed or lifting, rigid or steering third axles, with single or twin wheels. Leave us your contact details and one of our experts will contact you to help you understand the best solution for you. I consent to the processing of pesonal data. The Daily range boasts no less than four market-leading features: largest volume (20m3), highest horsepower rating (205 HP), greatest payload (4174kg) and most sophisticated full automatic transmission, the ‘Hi-Matic’ ZF 8-speed. #IVECO 40, a 40 year history, a great journey through time!